We’ve all been on a few musical and historical journeys through the streets of Liverpool. Sometimes, when the sun is still up, too… but not like this. Liverpool Music Tours invited us for a walk across town, stopping off for a pint and a song along the way. Of course, we already knew about a lot of what was in the air, but there was still enough information to trigger that all-important movement on the shoulder. By Alan O’Hare. “Look up!” I always heard that walking around town as a kid. Fair enough, I was usually about to bump into something, but now and again it would be someone imploring me to take a bigger interest in my surroundings. It’s stuck with me, too, as I’m always doing it to other people these days. Like most modern city centres, town can offer a fairly mundane meander through the current crop of crass commercial cash cows. But, look up, and a different picture emerges. I was reminded of this again recently on the inaugural jaunt of Liverpool Music Tours. Led by the gregarious Peter Morgan and ballad singer, Alan Burke, the educational experience was a revelation. 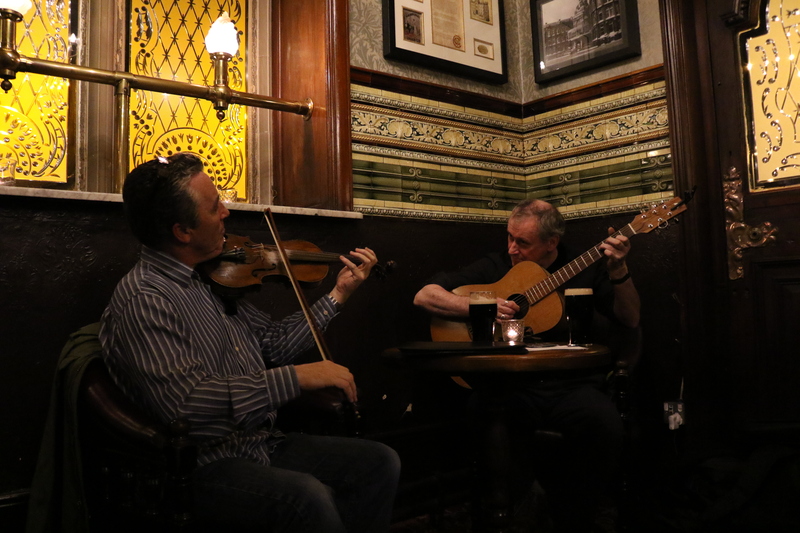 Sure, the venues we visited were familiar and many of the tales told already on the tips of the tongues of the dozen or so punters along for the ride, but the drinks were flowing, the songs were good and the craic was mighty. “We are a new company sharing the history of the city through stories and song,” say the founders. “All our tours are led by experienced musicians and incorporate visits to some of Liverpool’s finest old pubs.” So far, so ‘typical tourist trap’. But that’s where the comparison with established ‘walks’ ends… Liverpool Music Tours are alive. Know what I mean? The tangible tinge of excitement we all felt when a group of Spanish students and tourists joined in our sing-along in Ye Cracke on Rice Street was worth the entrance fee alone. Often, these kinds of tours (no matter what city you’re in) are mundane affairs, with hosts reading from a script and ‘ad-libbing’ rehearsed rhetoric. But this one is different and that’s down to two reasons: the hosts. Belfast-born Morgan came to Liverpool to study over thirty years ago and him, his teaching and his violin have never left the place. He’s a great talker, listens when he’s interrupted and never loses the flow. Ballad singer, Burke, meanwhile is the secret weapon: the Dublin troubadour’s relationship with Liverpool began when he was a cornerstone of the four acclaimed Irish Sea Sessions concerts and albums produced in Liverpool, Ireland and London over the last decade or so. A member of Rambling Boys of Pleasure, Burke possesses an inexhaustible repertoire of traditional and contemporary material that lends itself perfectly to the story of our city. Need a broadside to accompany a chat about Ye Cracke’s history of hosting dissenters? Burke will reach for his capo and open his lungs to deliver a devastating lament connected to the story. There’s questions, too, it’s not all about songs and swigging! During my couple of hours in their company, Liverpool Music Tours taught me a lot… well, do you know what just happens to coincide with the length of Hope Street or what ‘Rita’s limousine’ is? The whole of the city’s Georgian Quarter comes under scrutiny and we took a pint in the Phil, Cracke and Peter Kavanagh’s along the way, whilst there are plans to offer a tour of the waterfront soon, too. Let’s hope it catches on, music has always been the one thing missing when organisers try to connect Liverpool’s past and present – they either ignore it (lots of The Beatles’ tours completely miss Billy Fury’s massive part in their songwriting development) or get it horribly wrong (Ringo Starr, anyone?). The stories, songs and singing here all had an aim that was true.